Above is a snapshot of a three-dimensional simulation of a Type Ia supernova, shortly after the nuclear flame bubble that initiates the Ia event is ignited slightly off-center from the progenitor white dwarf star (shown here as a light-blue surface). Robert Fisher and Cal Jordan are among a team of scientists at the University who will expend 22 million computational hours during the next year on one of the world’s most powerful supercomputers, simulating an event that takes less than five seconds. Fisher and Jordan require such resources in their field of extreme science. Their work at the University’s Center for Astrophysical Thermonuclear Flashes explores how the laws of nature unfold in natural phenomena at unimaginably extreme temperatures and pressures. Argonne National Laboratory’s Blue Gene/P supercomputer will serve as one of their primary tools for studying exploding stars. Desktop computers typically contain only one or two processors; Blue Gene/P has more than 128,000 processors. What a desktop computer could accomplish in a thousand years, the Blue Gene/P supercomputer can perform in one. “It’s a different scale of computation. It’s computation at the cutting edge of science,” Fisher said. Access to Blue Gene/P was made possible by a time allocation from the U.S. Department of Energy’s Innovative and Novel Computational Impact on Theory and Experiment program. The Flash Center was founded in 1997 with a grant from the National Nuclear Security Administration’s Office of Advanced Simulation and Computing. The NNSA’s Academic Strategic Alliance Program has sustained the Flash Center with funding and computing resources throughout its history. 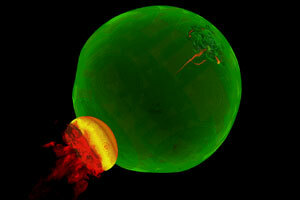 Buoyancy forces drive the bubble (shown in yellow and red) rapidly to the surface of the white dwarf. 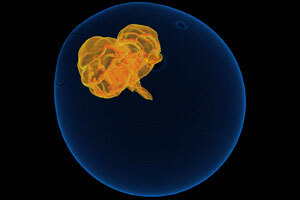 The image shows the nuclear flame bubble at high-resolution and depicts the vorticity of the flow, demonstrating the complex, turbulent hydrodynamical processes that govern the nuclear flame bubble burning during this stage, close to bubble breakout. The support stems from the DOE’s interest in the physics that take place at extremes of concentrated energy, including exploding stars called supernovas. The Flash Center will devote its computer allocation to studying Type Ia supernovas, in which temperatures reach billions of degrees. A better understanding of Type Ia supernovas is critical to solving the mystery of dark energy, one of the grandest challenges facing today’s cosmologists. Dark energy is somehow causing the universe to expand at an accelerating rate. Cosmologists discovered dark energy by using Type Ia supernovas as cosmic measuring devices. All Type Ia supernovas display approximately the same brightness, so scientists could assess the distance of the exploding stars’ home galaxies accordingly. Nevertheless, these supernovas display a variation of approximately 15 percent. “To really understand dark energy, you have to nail this variation to about 1 percent,” said Jordan, a Flash Center Research Associate. The density of white dwarf stars, from which Type Ia supernovas evolve, is equally extreme. When stars the size of the sun reach the end of their lives, they have shed most of their mass and leave behind an inert core about the size of the moon. Type Ia supernovas are believed to only occur in binary star systems, those in which two stars orbit one another. When a binary white dwarf has gravitationally pulled enough matter off its companion star, an explosion ensues. The Flash team conducts whole-star simulations on a supercomputer at Lawrence Berkeley National Laboratory in California. At Argonne, the team will perform a related set of simulations. “You can think of them as a nuclear ‘flame in a box’ in a small chunk of the full white dwarf,” Fisher said. 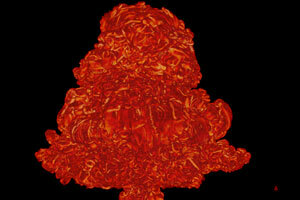 The image is a snapshot of a Type Ia supernova simulation taken shortly after the moment of detonation. In the simulations at Argonne, the team will analyze how burning occurs in four possible scenarios that lead to Type Ia supernovas. Burning in a white dwarf can occur as a deflagration or as a detonation. In the Flash Center scenario, deflagration starts off-center of the star’s core. The burning creates a hot bubble of less dense ash that pops out the side due to buoyancy, like a piece of Styrofoam submerged in water. But gravity holds the ash close to the surface of the white dwarf. “This fast-moving ash stays confined to the surface, flows around the white dwarf and collides on the opposite side of breakout,” Jordan said. The collision triggers a detonation that incinerates the star. There are, however, three other scenarios to consider. “To understand how the simulations relate to the actual supernovae, we have to do more than a thousand different simulations this year to vary the parameters within the models to see how the parameters affect the supernovae,” Jordan said.